When I became a type 2 diabetic, I wanted to find a way to manage my weight and blood sugar with diet and exercise. I tried the high carb diet recommended by my doctor and dietitian for a time. It worked wonderfully well while my blood sugar level was high, but when my blood sugar stabilized and I was able to go off medication, I started gaining weight again. The next thing I tried was low carbohydrate dieting. I found it to be a very effective way to lose weight rapidly, but I was unable to endure the regimen for more than a short time. So I decided to adapt a moderate carbohydrate style of eating. Just enough carbohydrate to make me happy and supply me with the appropriate level of nutrients. I discovered two principles to be very useful for this lifestyle: eating foods with a low energy or calorie density, and eating foods with a low glycemic impact. There are two ways to reduce calories. One is to eat less food. This way seldom works. Another way is to eat food with a lower energy, or calorie density, per serving. If we can increase the volume of food we eat while maintaining the same level of calories, we can feel full and satisfied without weight gain. The first low energy density diet may have been the Target Diet, developed by exercise guru Covert Bailey and nutritionist Ronda Gates.1 The four food groups (meat, dairy, grains, and fruits or vegetables) were developed into a target. At the center of the target were low fat foods, low sugar foods, and foods with lots of fiber. Moving towards the outer rim were foods with higher levels of fat and sugar. The idea was to select most foods toward the center of the target. 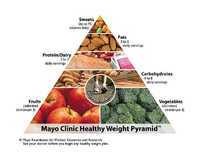 Another useful visual aid was the Healthy Eating Food Pyramid, developed by the Mayo Clinic.2 In this pyramid, the foods with the lowest energy density, non-starchy vegetables, were at the bottom. Above that were the fruits, and rising toward the top of the pyramid were whole grains and starchy vegetables, protein foods, and fats. At the top of the pyramid were indulgences that are not really necessary for our well-being except to provide feelings of comfort. Dr. Barbara Rolls of Pennsylvania State University developed a way to measure energy density.3 The calculation is performed by dividing the calories in a serving by the serving’s weight in grams, producing a number ranging from zero to nine. The maximum energy density is nine because, as mentioned, pure fat has nine calories per gram. All other foods have a lesser value. For example, raisins have an energy density of three: This means that there are three calories per gram in a serving of raisins. Strawberries, on the other hand, have an energy density of only 0.20. This means that there is only one-fifth calorie for each gram of strawberries. Looking at this a different way, fifteen grams of strawberries have the same calories as one gram of raisins. Obviously, the strawberries can satisfy hunger with far fewer calories. Eating foods with lower energy densities can satisfy hunger even during a period of weight loss. Dr. Allen is currently working on a fat storage index that measures the actual fat stored as a result of eating various kinds of food. One difference between this approach and the glycemic index is that the new approach also measures the fat storage effects of such items as diet drinks and sugarless chewing gum. Fat storage happens because the sweetness of these items results in an increase in insulin levels. This in turn drives blood sugar into storage. The glycemic load, which was developed by researchers at Harvard University7, applies the glycemic index to specific serving sizes. It is a measurement of how many of the carbohydrate grams in a serving are converted to blood sugar. High glycemic index foods need not be avoided altogether, as many contain valuable nutrients. The glycemic load provides a way of monitoring the glycemic response from higher glycemic index foods. Is there a way to combine energy density and glycemic impact? I developed an approach to this synthesis, which I call glycemic density. I was thinking about the principles of energy density and glycemic impact when a thought flashed through my mind: Why not calculate the glycemic load in a gram of food? Thus, the concept of glycemic density was born. If we tend to eat by weight rather than by macronutrient content, eating foods with a lower glycemic density could be a valuable way of lowering the glycemic impact of our diets. A variation of this is a table scheme that I have dubbed the glycemic matrix. Four levels of glycemic density are listed along the horizontal axis, and four levels of the glycemic index are listed along the vertical axis. This gives a complete picture of the possible glycemic impact of the various foods listed. Foods with the lowest glycemic density and the lowest glycemic index have the least impact. Foods with the highest glycemic density and the highest glycemic index have the most impact. These ideas, while they are logically compelling, need to be scientifically verified. As a result, I have been searching for a clinic or university that would be willing to undertake this study. Even though I have conceived this idea, someone else could take over “ownership” of the concept. I can be reached at richardalanprice@gmail.com, should any reader be interested in this project. Many have tried to lose weight and failed, but many of us have been successful. For a number of years, I have been able to maintain my weight and blood sugar through diet and exercise. I am a member of the National Weight Loss Registry, having lost a considerable amount of weight and kept it off for at least five years. Many others can do the same. It is my sincere desire that you are successful in achieving your goals. Richard A. Price is the author of several books on weight and blood sugar management, including Glycemic Matrix Guide to Low GI and GL Eating, published by Infinity Publishing. He and his wife Arlene are the parents of three children. They live in Albany, Oregon. 1. Bailey, Covert, The Fit or Fat Target Diet, (Boston: Houghton Mifflin Company, 1984) and Bailey, Covert and Gates, Ronda, Smart Eating, (Boston: Houghton Mufflin Company, 1996). 2. Hensrud, Donald D., M.D., Mayo Clinic on Healthy Weight, (Rochester, Minn: Mayo Clinic, 2001) and Hensrud, Donald C., M.D., The Mayo Clinic Plan, (New York: Time, Inc, 2006). 3. Rolls, Barbara, Ph.D. Pennsylvania State University and Barnett, Robert A, The Volumetrics Weight-Control Plan, (New York: HarperTorch Imprint of HarperCollins, 2003) p 12 and Willet, Walter C., M.D., Harvard School of Public Health, Eat, Drink and Be Healthy, (New York: Simon & Schuster, 2001) p 46. 4. Brand-Miller, Jennie, Ph.D., Wolever, Thomas M.S., M.D. Ph.D. Foster-Powell, Kaye, M. Nutr & Diet, and Colagiuri, Stephen, M.D., The New Glucose Revolution, (New York, Marlow & Company, 2003) p 23. 5. Biography of Dr. Ann de Wees Allen (Glycemic Research Institute), 5 Sep 2008, (www.GlycemicResearchLaboratories.com/BIO-ADW-07/ADW-BIO-07.pdf).